This is the ninth of Dean's books, launched in July, 2011. Dean Brettschneider is a professional baker and patissier. After completing his apprenticeship in New Zealand, he worked in the US, the UK, Europe, Asia and the Middle East gaining experience in all areas of the trade. Following some years based in Shanghai, Dean now works from Denmark and the UK, but still visits New Zealand regularly throughout the year and has bakery interests in Auckland and Shanghai. 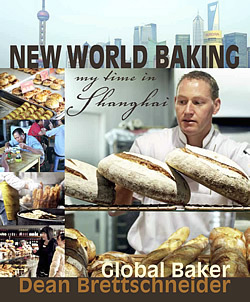 Dean’s previous baking books have won World Food Media Awards and Gourmand World Cookbook Awards. He is also a judge for the successful television series (now in its 3rd season), New Zealand’s Hottest Home Baker, and appears in many other television programmes that promote baking excellence. At Marshall Cavendish, our vision of enriching life through reading and lifelong learning is excellently fulfilled by our General & Reference Publishing arm, which is one of the largest general trade book publishers in Southeast Asia. Times Centre, 1 New Industrial Road, Singapore 536196.